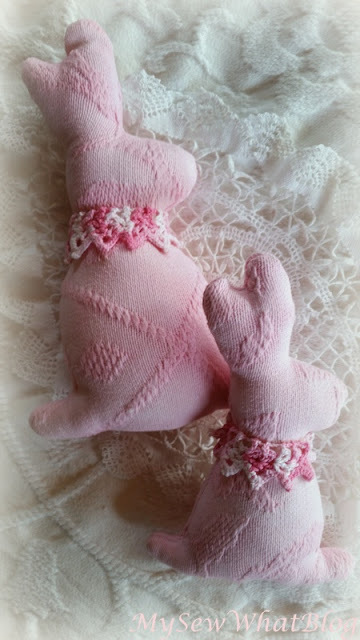 In my last post FOUND HERE I shared some bunnies that I had stitched up from a recycled bedspread. 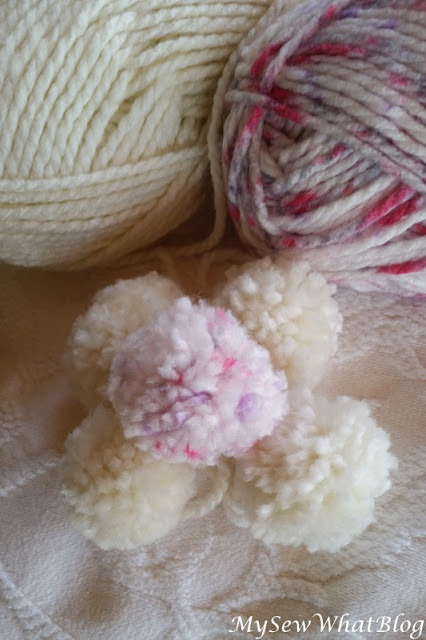 I spent some time yesterday relearning how to make pom poms (for bunny tails) using some very old templates that my grandmother used many years ago. 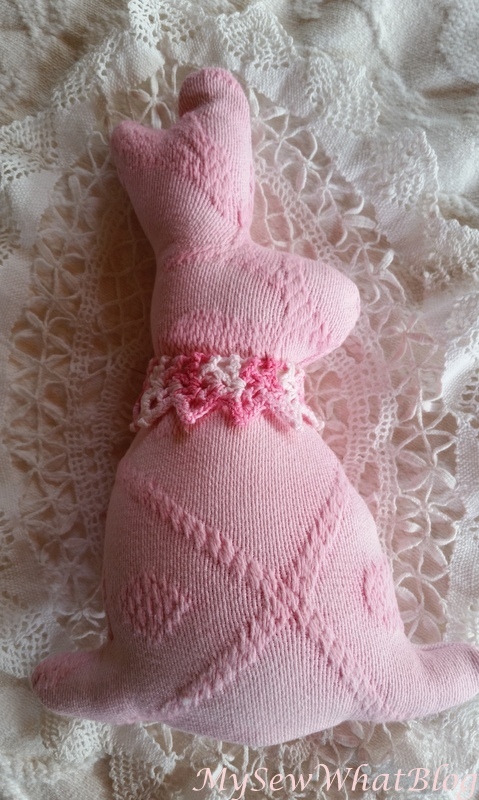 My grandmother was very talented at knitting and crochet. Hats, slippers and ponchos that she made for us over the years were embellished with her handmade pom poms. 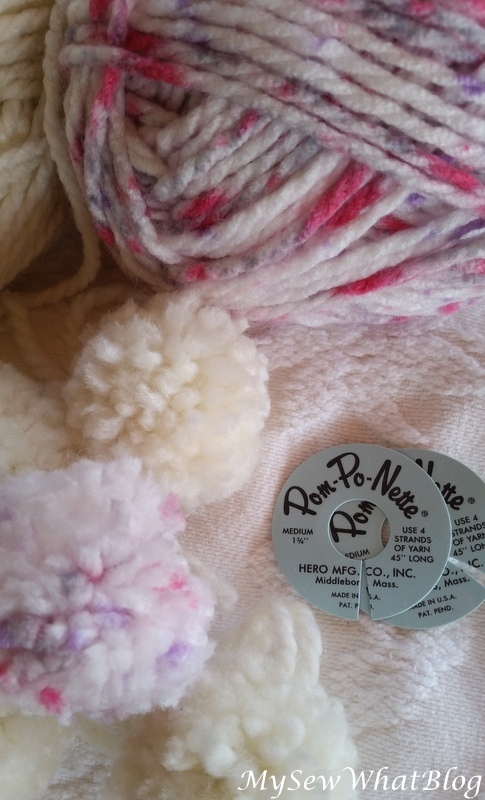 I had to dig very deep folks (in the memory banks) to remember the instructions my grandmother used to teach me to make pom poms so many years ago. I achieved pom pom success on the first try! These were my grandmother's templates. I have no idea how old they are. I also found some that she had made out of cardboard. They worked just as well. Here is a better view of the pom pom tail. You may be wondering in what reality do bunnies have multicolored tails? The answer is simple: in my reality! 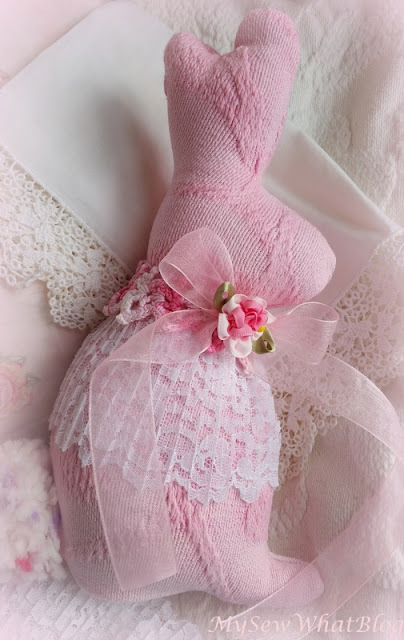 The very same reality where bunnies are pink and wear lace, hand crocheted collars, bows, ribbon flowers and other embellishments! I love these little pink ribbon flowers that I picked up at Joanne Fabrics. 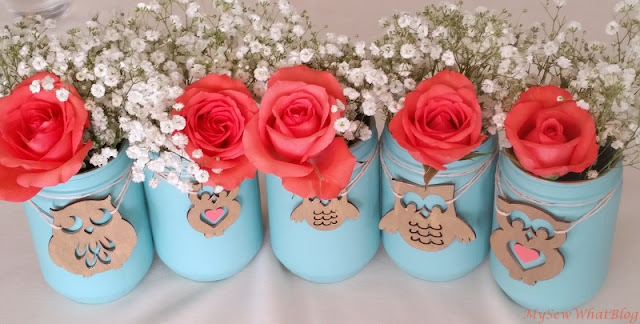 (One of these days I am going to learn how to make my own ribbon flowers!!!) I found the white lace in a bag of vintage laces at an antique shop in Vermont. The crochet edging was simply removed from a vintage pillowcase. It took me a couple of days to decide how to embellish my pink bunnies. 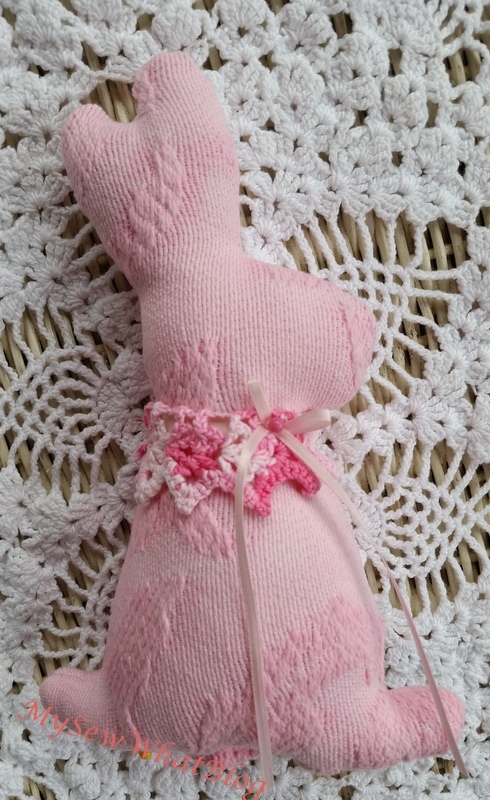 Now I am off to work on the rest of my Easter Bunnies. I may even get to work out on my back porch today, which is generally unheard of in February but it is a beautiful warm, sunny day here in NH. It is supposed to be in the 50's. I'll take it! 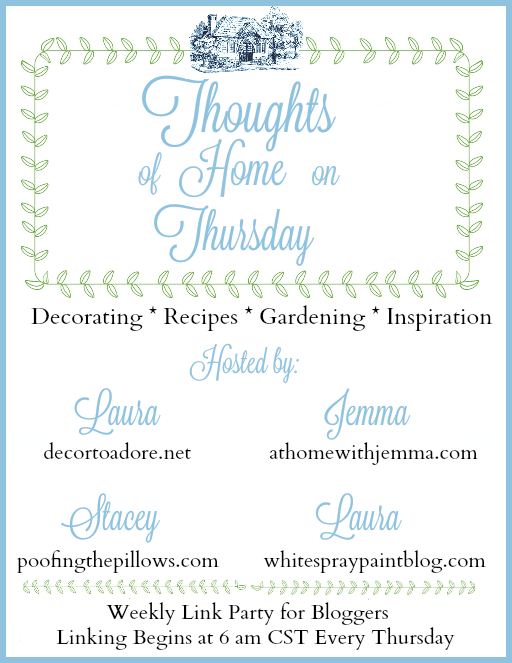 Thoughts of Home on Thursday--Please check out the blogs of all 4 talented hosts listed below! 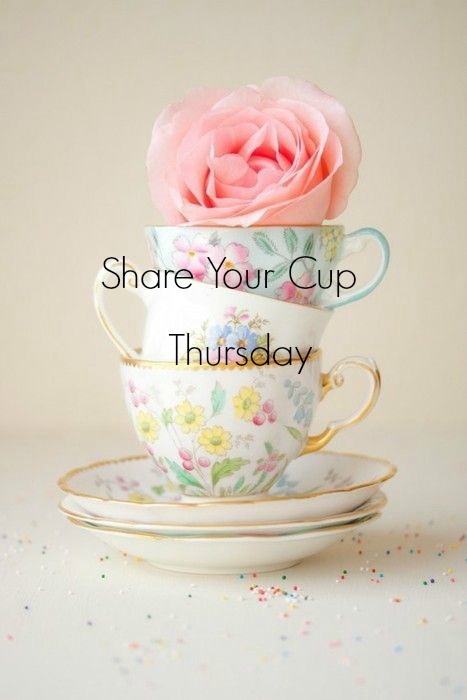 Click here to visit Share Your Cup Thursday! Hello friends! It's been a little while since my last post but I have been busy! For the last couple of days I've been working on some little stuffed Easter Bunnies. It began when my father was about to toss out an old bedspread, but being well trained, he asked me first if it was something I could recycle. Well, yah! I took it home and washed it up. It came out of the dryer looking like new! Then I grabbed a handful of scrap paper and began drawing a pattern that I could use to make the stuffed bunny. 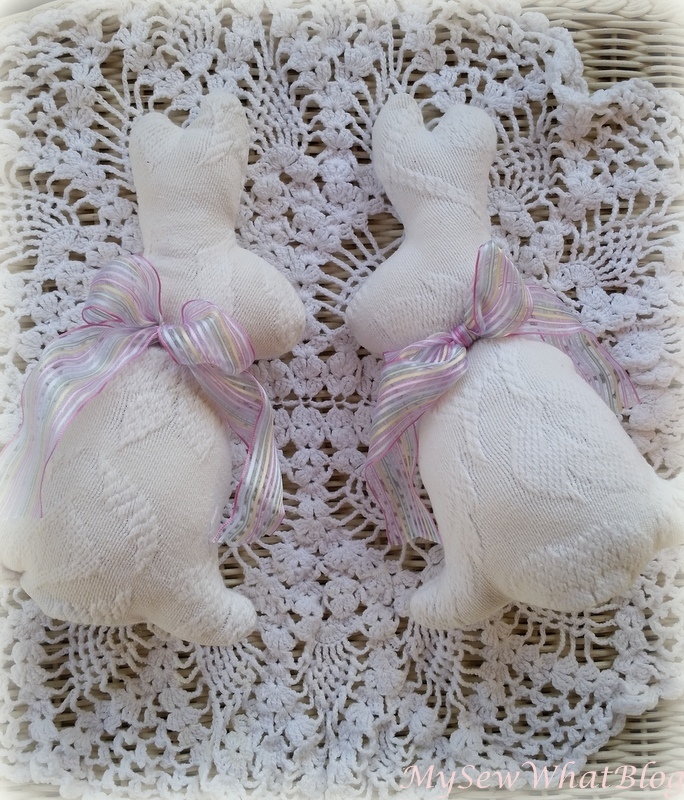 Since the bedspread was ivory, I thought a "white chocolate bunny" was the way to go. I used the entire stack of scrap paper trying to draw the pattern. I do not have the best drawing skills but I finally arrived at something I could live with. I took the pattern into the computer room and made copies in several sizes.....they will come in handy for some other Easter projects I have in mind. 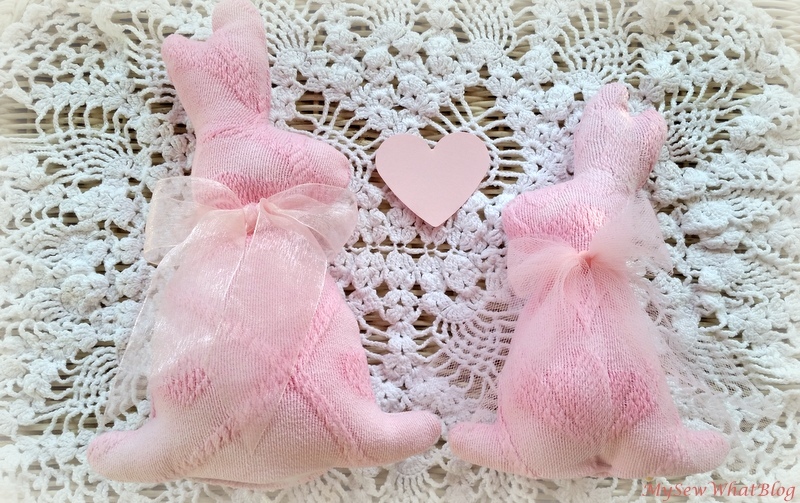 The first two bunnies turned out like this! They are quite cute actually! Then I got to thinking how cute these little bunnies would look in other colors. 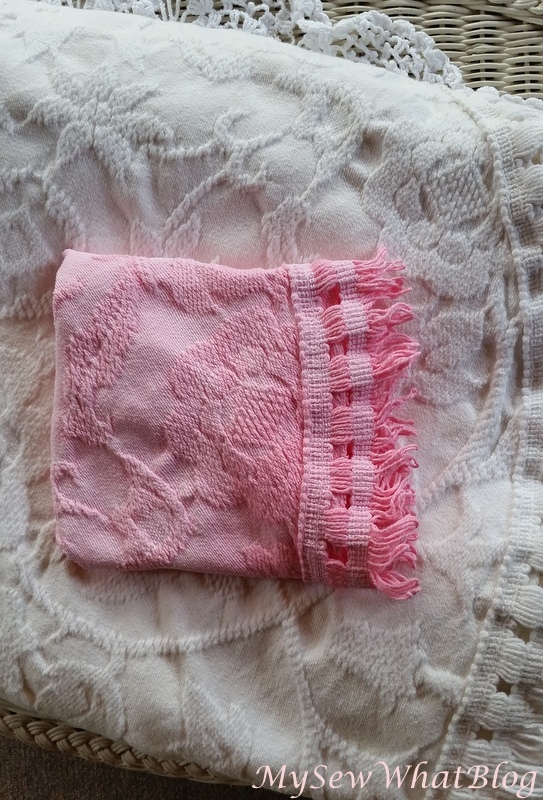 I did happen to have some pink fabric dye so I gave it a whirl. Here is the first little pink bunny I made. It's about 8 1/2" tall. 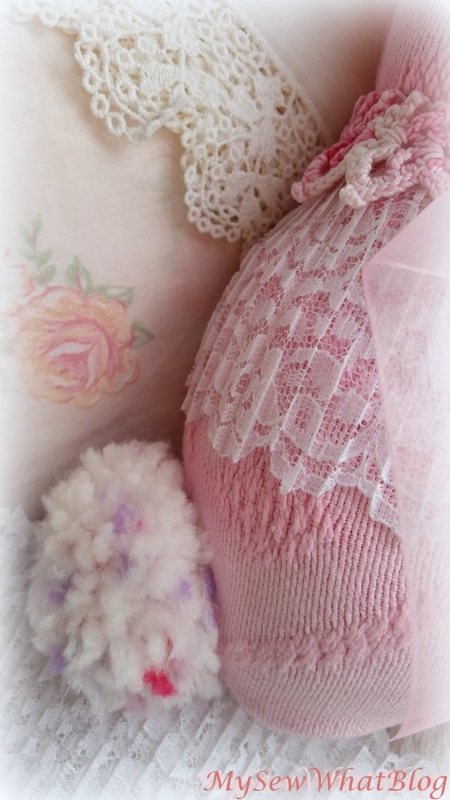 I removed some crocheted edging from a vintage pillowcase and used it for the trim around its neck. The bow is only pinned on in the photo. 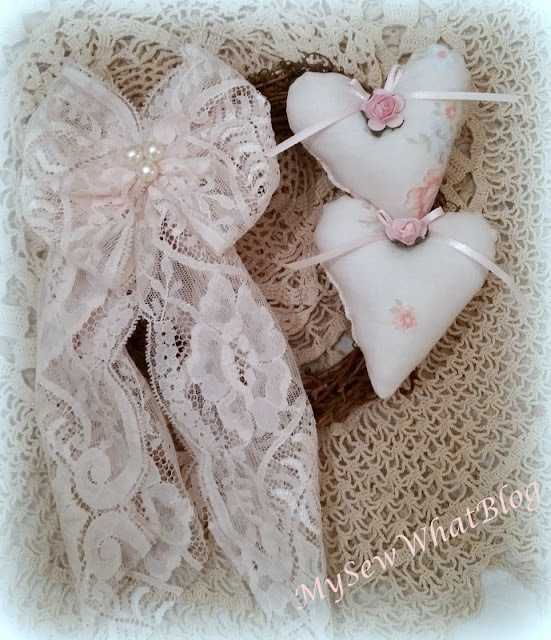 I am going to pick up some wider organza ribbon and then go hunting in my large collection of vintage trimmings for some additional embellishments. This one is a larger version at about 10 1/2" tall. She is not completely trimmed yet, none of them are stitched at the bottom and all may end up trimmed a little differently than shown here. 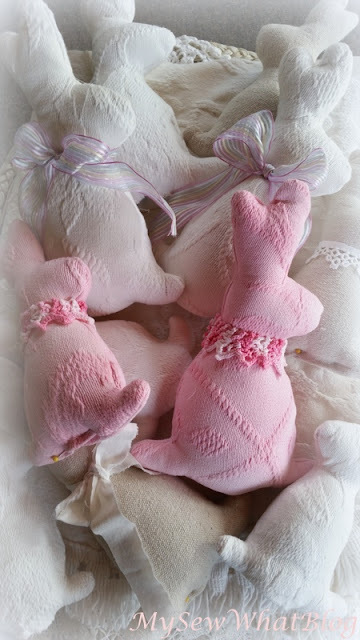 I do love the little pink bunnies! My bunnies are reproducing quickly. In this photo you can see I used some cotton canvas which also stitched up well. 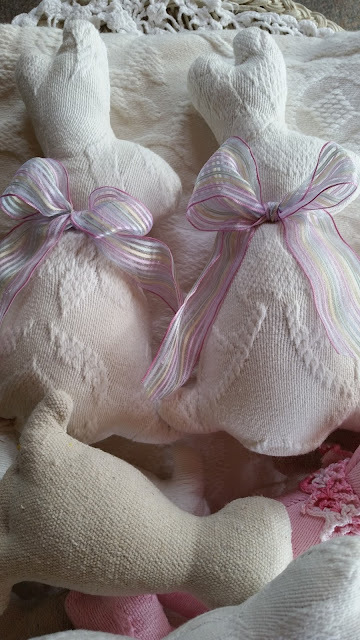 Today I will decide how they will be embellished and then I plan to make some matching pom poms for their tails. They still have to have their openings stitched closed and some may even need a little more stuffing. I plan to work on some of the finishing touches and hand sewing tonight while watching a little TV. Once I get my bunnies completely finished I will post an updated photo. My days are still quite full with some family obligations so my projects take a bit more time to complete and my posts are not as frequent. My heart is still here though and I think of my dear blogging friends every day! Hope you are all well! UPDATE: 2/27/16 Click HERE to see update on bunnies. pretty soon you have a dozen." Dropping by with a short but sweet post to wish you all a very Happy Valentine's Day! Today's project is another small, 6" grapevine wreath just in time for Valentine's Day! These look so pretty tied on to a gift package! 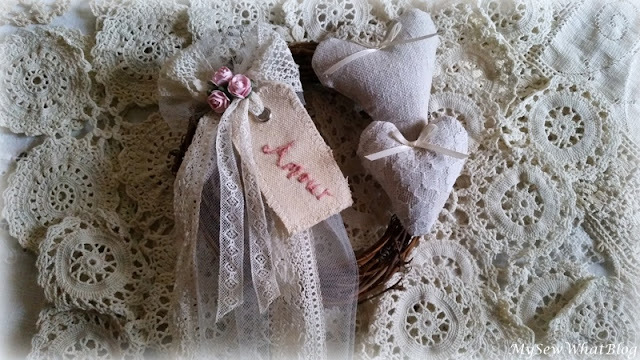 Lots of pink lace, some faux pearls, pretty pink floral hearts, ribbon and paper roses all work well together to create a wreath perfect for Valentine's Day or any day for that matter. You may remember this wreath from an earlier post a few weeks back.....if not, here is the link to that post. Please click here! ......Same idea, different fabric and style. Enjoy spending time with your favorite Valentine(s) this weekend. 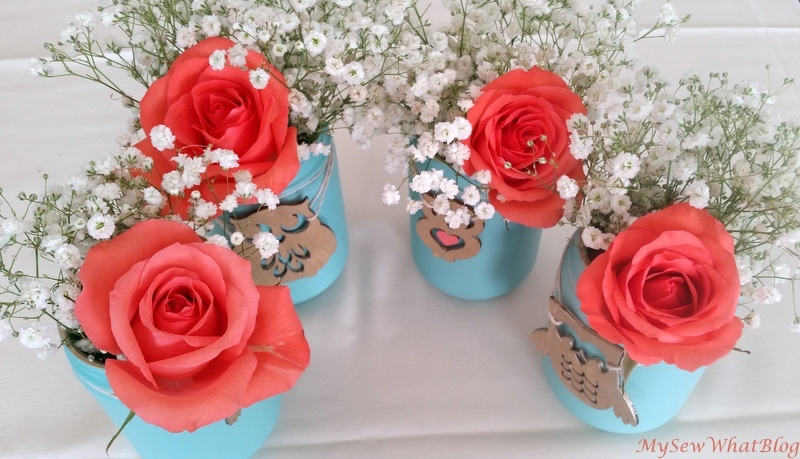 I recently attended a baby shower and these were the centerpieces on the tables. Aren't they just the cutest! I cannot take an ounce of credit for these cuties!! They were created by Lisa. (sister-in-law to my daughter Jenn) They are both going to be aunties to identical twin girls some time in April! How exciting is that! You can imagine my delight when I was given a couple to take home! 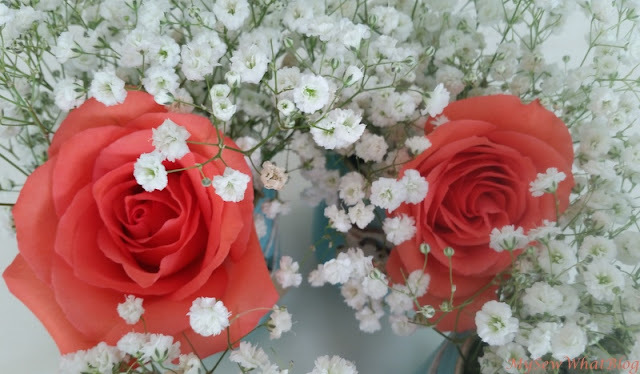 The coral roses were so fragrant.....the babies breath was so robust! I love the color combination! 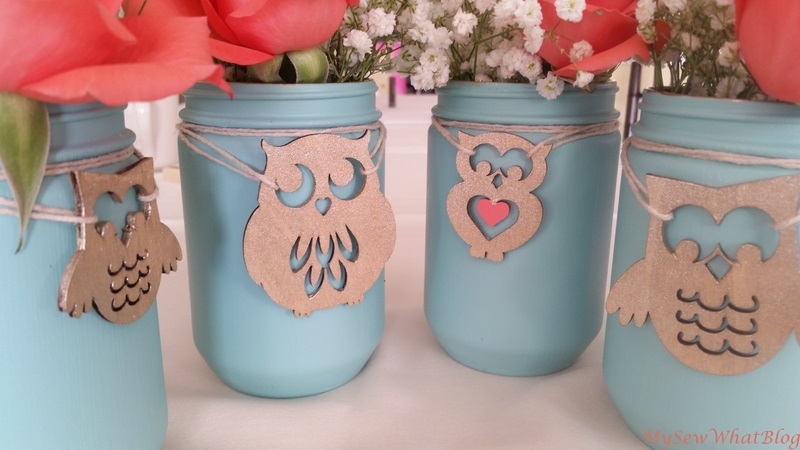 I also love owls!! 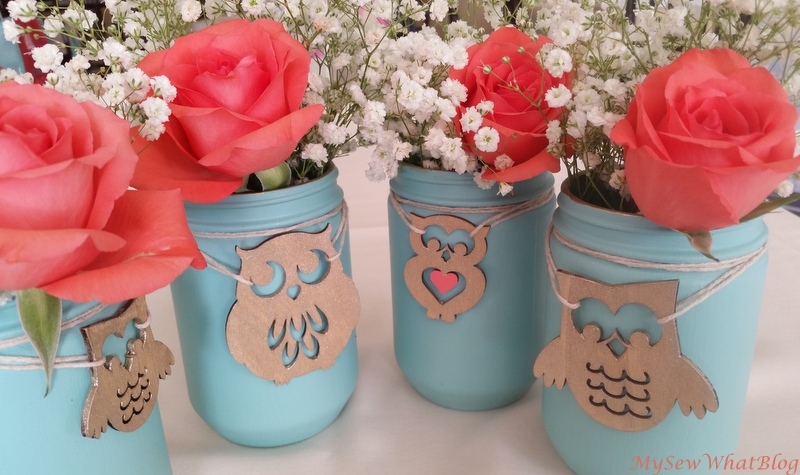 I think Lisa did a wonderful job creating these little floral centerpieces for her sister's owl-themed baby shower. Lisa is thinking of starting a craft blog. I told her that when she does I will provide you all with a link to her blog so you can check out her creative works of art! I am already a fan! Why can't we be like that wise bird?" 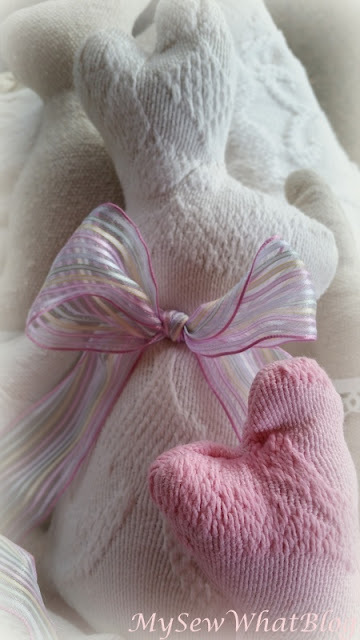 I have lots of friends having babies and grand babies so over the the last couple of days I have been making handmade gifts for baby showers and to celebrate births. I confess that this is some of the most fun I have had sewing in a long time. There's just something about soft flannels in pretty colors and designs. 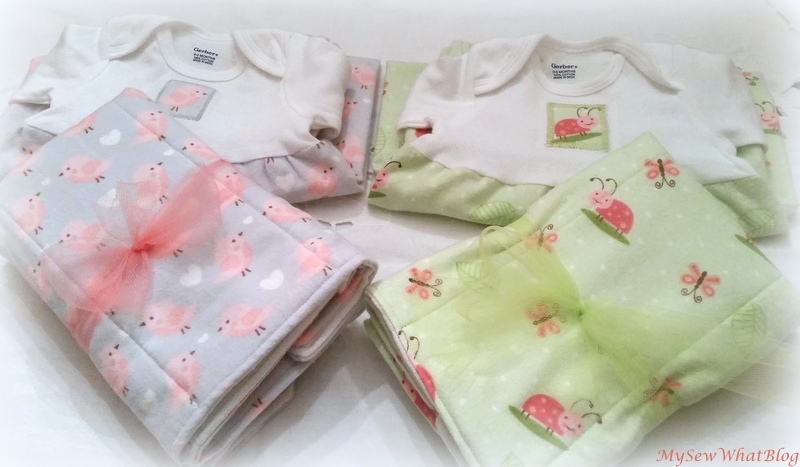 These are Joann Fabrics designs and they made the sweetest little gowns and burp cloths! I started with a Gerber long sleeved t shirt and cut it under the armpits to create an empire waist. I then cut a tube of flannel a little more than 3 times the width of the t shirt where I made the cut and about 23" long. I zig zagged the raw edges of the flannel piece and stitched a tube joining long ends and right sides together. I then pressed the seam opened. I think the next time I make one, I will cut two pieces and stitch side seams together. I prefer the seams on the side and it is easier to match up the flannel piece to the side seams of the tshirt. I've done it both ways--I guess it's really a matter of personal preference. 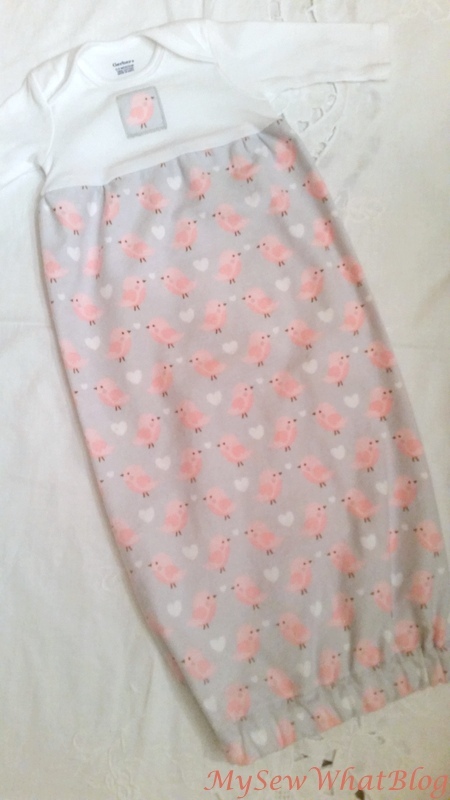 ***Please note: when stitching a non-stretch fabric to the stretchy tshirt or onesie I often purchase one size up on the tshirt or onesie just to be sure there is enough stretch to fit over babies head. The very first gown that I made many years ago would not fit because without thinking I stitched some eyelet lace around the neckline. This of course prevented the opening from stretching over baby's head. The same principle applies to the empire waist in these gowns. Attaching flannel (instead of a stretchy knit) to the onesie will prevent the tshirt from stretching properly at the empire waist. This could make for one unhappy little baby at dressing time. I made a casing and used about 17" of 3/4" elastic because I happened to have some on hand. After fishing the elastic through the casing I stitched the two ends of the elastic together and sewed the opening in the casing closed. You can also make a casing a few inches above the hemmed bottom which will give it a gathered ruffle effect. My youngest daughter had one and it was the cutest thing. I believe I created the casing by using bias tape. I've even used wide ribbon if I didn't have bias tape on hand. The last thing that I did was cut a small square out of the flannel for an applique using fusible web. After fusing the applique to the top, I pinned a stabilizer to the back of the applique. For the stabilizer I recycled a dryer sheet and cut a square slightly larger than the applique square. Once everything was in place, I stitched around the applique with a zig zag stitch. 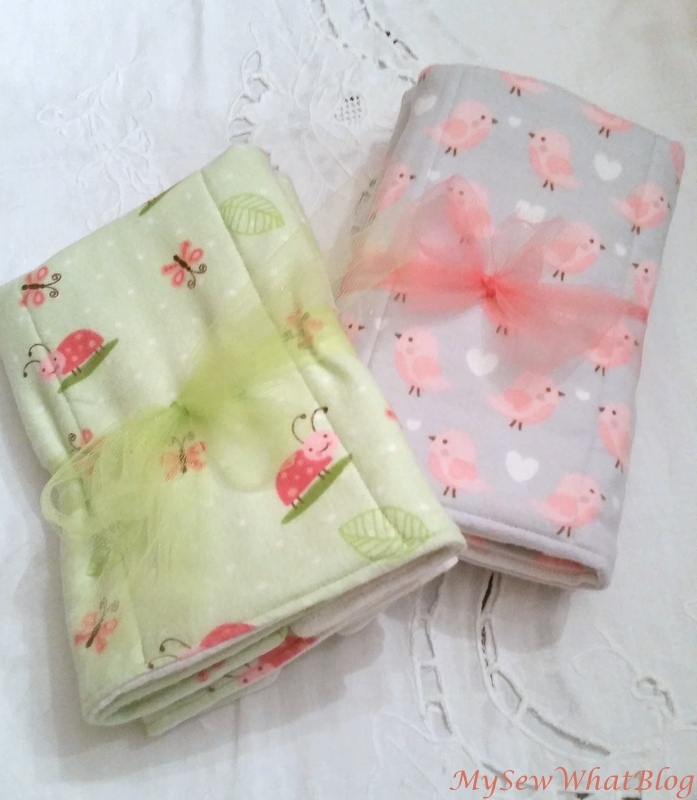 The burp cloths are made from prefolded cloth diapers. A piece of the flannel is sewn to the cloth diaper right sides together, turned and topstitched. Then following the stitching already on the diaper, I restitched right on top of the vertical diaper stitching making sure I placed white thread on the top of my machine and gray thread in the bobbin. Then I folded them in thirds and tied them up with a tulle bow. This was the second little gown that I stitched up. I call this one Cootie Patootie! The little bug is so cute! While sewing this gown, my sewing machine quit on me. I know, it's only a year old. A thread got caught in the tension thingies (yes, that is a technical term) and I am hoping that I did not break or bend anything while trying to yank it out. My machine is heading in for service in the morning. Luckily I have another machine which allowed me to complete my project. Anyways, I love how they turned out. 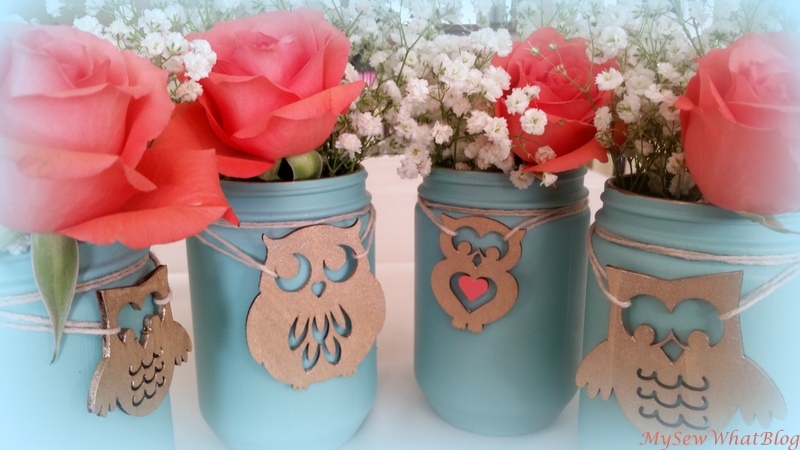 There are many, many tutorials with photos on various blogs and pinterest. 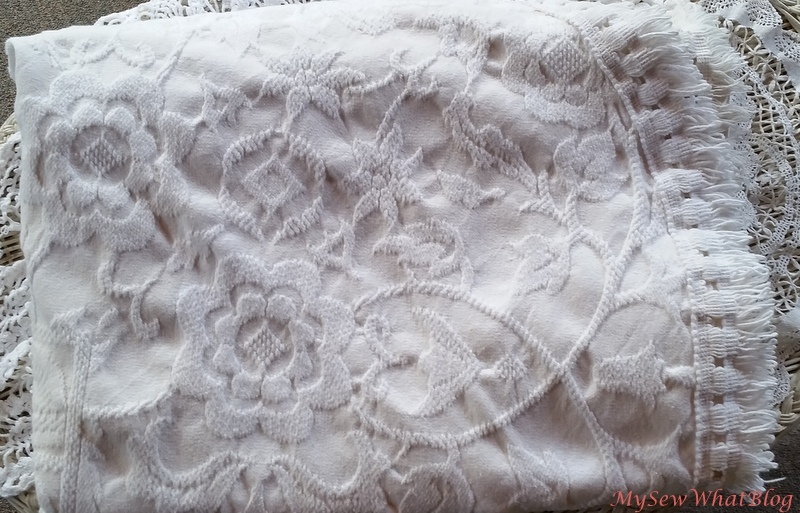 Everyone has their preference as to how to sew and embellish their gowns and burp cloths. I really wanted to attach a pretty ribbon bow or fabric flower to the front of the gown but from personal experience a tied bow never comes out of the washer looking nice. 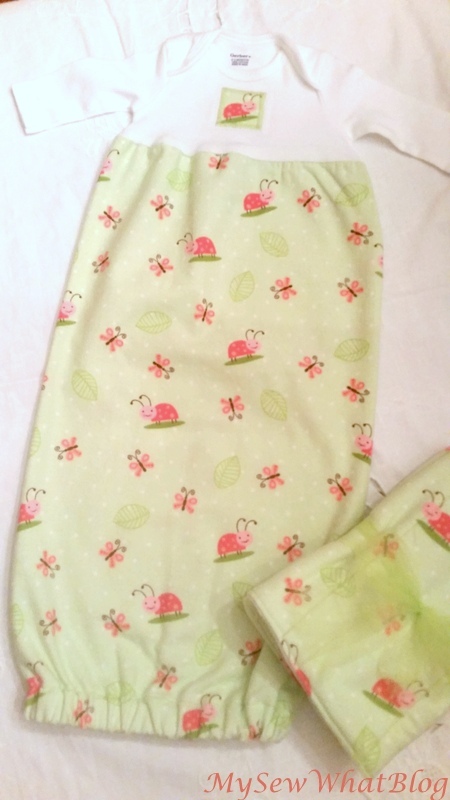 Bows and flowers made from the fabric are often bulky and uncomfortable for baby to lie on. I learned this the hard way when my own girls were babies. These are so much fun to stitch up and I am looking forward to making a few more. Many years ago I made a pattern for bubble britches (my name for them) and they can also be attached to a t shirt in the same way. The legs and crotch had snaps which made diaper changes easy. I hope to locate it because it was so very sweet and comfy for baby to wear. We are also talking about a pattern I used roughly 20 years ago so I will probably have to start the pattern from scratch. Once I have spent hours trying to recreate the pattern, I will no doubt locate the original one. 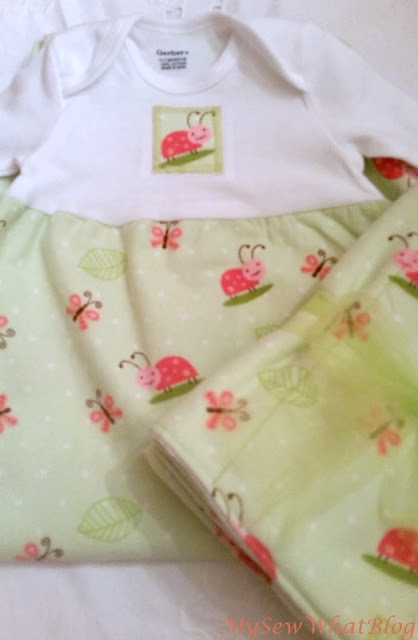 If you'd like to try your hand at stitching up some of theses sweet gowns, I have pinned some links to similar baby gowns on pinterest along with some other sweet DIY baby gift creations. Simply follow this LINK! IF you aren't into sewing them yourself, there are plenty of sweet gowns to be found on ETSY. As always, thanks for stopping by! I appreciate your visit!